Al-Shabaab, the Somali terrorist group that has recruited members in several U.S. cities, has broadened its appeal in a new recruiting video. "O' Muslim youth around the world, do not forget the call of your brothers in Somalia, as their condition calls out, 'O' emigrants, O' emigrants. So is there anyone to respond?" said the voice of Shaykh Saleh Al-Nubhani, also known as Saleh Ali Saleh Nabhan, the deceased leader of Al-Shabaab. Al-Shabaab's latest recruitment video, "An Invitation to the Lands of Jihad and Ribat," is dubbed in English and Somali to resonate with Muslim youth abroad. 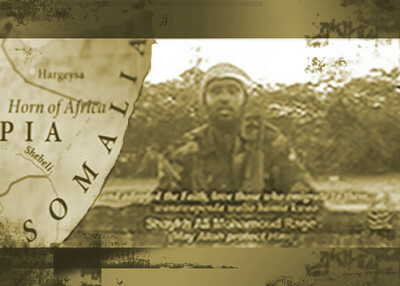 Although this is not Al-Shabaab's first video appeal to attract foreign fighters, it shows a new emphasis on targeting vulnerable youth from the Somali exile as well as East African nationals inspired by Al-Shabaab's vision of an Islamic state. It's also not a call to liberate the country from the Ethiopian army invasion in 2009, a cause that had broad appeal among many groups of Somalis, or a typical al-Qaida style video calling for attacks on America. Such clips have been released by American Al-Shabaab recruiter, Omar Hammami, for several years now. In combination with personal recruiting, these videos have drawn Somali youth from as far as Minnesota and Australia. However, they have been limited to audience that is already drawn to the message of jihad. The new clip represents a different tactic, one that broadens the appeal of a life of jihad to a new audience. The clips of military training and triumphant victory parades are also overlaid with fighters from all over the world calling out to their religious brothers in English, Swedish, Swahili and many other languages. They talk about defending the rights of Muslims, but not of bringing the fight to America's shores. They also talk about creating an ideal society based on Islamic law. However, despite differences in the speakers' languages and presentation, the overall message is consistent. The West is fighting a war against Islam and Somalia needs help at the frontline. "What are you waiting for O' youth?" Al-Nubhani said on the video. "If you do not fight Jihad today then when will you? O Muslim youth, free your brothers from the darkness of oppression and the brutality of the enemy blows. Search for death and you will attain life. Come to jihad, you will gain honor in this life and the next." The appeals to fight against the enemies of the Muslims in Somalia have already drawn young men from a variety of places and communities. In particular, the effect on the Somali Diaspora community has been persuasive, where dozens of youth have abandoned their adopted nationalities and returned to protect their ancestral homeland. This video takes recruiting Somali exiles and foreigners to a new level. Al-Shabaab's current spokesman, Ali Mohammad Rage, welcomes those fighters who have already arrived and praises them as family. "Allah has blessed us out of His bounty with a handful of noble Muhajireen, emigrants," he declares. "We rejoice at their arrival and are happy to honor them… we pledge to Allah to protect them with our blood, and to carry them upon our shoulders, and protect them from that which we protect ourselves and our families." Islamist warrior Abu Dayana also pulls on the heartstrings of other English speakers, laying out the significance of the fight in a thick British accent. His speech is, above all, a personal declaration. "I'd like to take my time to talk about the blessings of living in the land of jihad," he preached. "First of all, before some of us came here, we were living in a society where people were enslaved by their desires... then Allah guided us in coming to this land, so we may have a part in establishing a society where the laws of Allah will be implemented." For him, Somalia was an Islamist paradise, "a place where our freedom and wealth won't be taken away from us because of our beliefs and working for our beliefs." Beyond praising the glories of battle, Abu Dayana stresses the need for youth to take action. "I would like to take this opportunity to… invite all the Muslims that are living in the lands of disbelief, the lands of oppression, to make hijra [migration] to the land of glory, to the land of izza [power], to the land of jihad." Alongside this invitation, which is repeated also in native tongues of East Africa and Pakistan, is the familiar voice of jihadist legend Abdullah Azzam. Not only does the video include audio of one of his speeches exhorting others to fight, but several speakers repeat messages that he popularized. Azzam preached that jihad is a fard 'ayn, an individual obligation as important as daily prayer, which must be practiced by all Muslims. He also derived the innovative concept that jihad was not a duty that stood apart from the pillars of Islamic practice, including prayer and pilgrimage, but rather that it was the highest form of worship. It was his words that speakers like Abu Ja'far of Kenya declared, "Why don't you leap forth for this act of worship? Join us so that we can together fight the forces of Kufr, just as they have united together to fight the religion of Allah." The same message is echoed in an audio clip by al-Qaida scholar Abu Yahya al-Libi. Other lecturers in the video stress the general call to the front, but appeal most strongly to other East Africans. Abu Mu'adh calls upon Ethiopian Muslims, which include a large section of ethnic Somalis, "to cross the borders into Somalia and participate in jihad alongside your Muslim brothers." Kenyans speak of the need for Muslims to unite around Somalia, while a Sudanese warrior urges the Muslims of his home country to join the fight "until we end in Palestine." One of the few fighters to address taking the fight to the West, in addition to coming to Somalia, is Abu Zaid of Sweden. In a mixture of Swedish and Arabic, he threatens Danish cartoonist Lars Vilks, who became the target of death threats for drawing the Islamic prophet Muhammad. "And I say to Lars Vilks, that where you are, if not today or tomorrow, know that we haven't yet forgotten about you." Drawing his finger across his throat, Abu Zaid threatened, "Know what awaits you, as it will be nothing but this, slaughter… and to my brothers and sisters, I call you to make Hijra [emigrate] Inshallah, and if you can, kill this dog Lars Vilks. Then you will receive a great reward from Allah." Al-Shabaab spokesman Ali Muhammad Rage closes the video with a declaration. "We say to our family in East Africa, Welcome to Somalia. Hakuna Matata [there are no worries]." Until the western countries get there act together and deal This Somali Coast of Pirates and the massive blackmail paid out of corporate funding including government funding. This scum knows your Christian weaknesses of caring and understand of root causes of poverty, while you are dithering in that area. They are devoting a lot of time using Internet, Religious meetings,by recruitment in all places of Western Culture,these groups once started, will get bigger as months pass by and they will intern will get braver and sadly another massacre of human beings, as they are on a holy mission, against Christianity, when we catch them, lets do the right thing and Pray for them,befor we send them on there way. But when you have weak leaders in power and tolerant Lords of Justice. and Presidents that only see as far as the nose,the Western world is vulnerable,it is most important that you wake up befor further atrocities are committed befor an another episode of recurring slaughter takes place. The people elected you the leaders of are countries to take care of them, and todate there is huge gap for improvement by are Leaders. Resurrect the Spirit of the British bulldog, or have you forgot your Identity.